My work generally involves the application of electrical engineering to explore scientific (psychophysical, psychological, physical) domains. I like to work in varied areas of application as the sampling of projects below shows. Throughout the past 8 years since first coming to MIT as a post-doc I have had the privilege to follow this approach and to interact with many talented students and colleagues. My goal is to continue to work in an environment that values creativity, in which I can contribute to a larger organized goal while having the freedom to pursue extracurricular projects that might ultimately feed back into my main work. 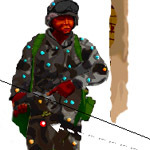 Most of the VE work in the RLE/Sensory Communications Group has been supported by ONR as part of their Virtual Environment Technology for Training program. The focus (and name) of the project has undergone many changes since it's inception in 1993, and my involvement has included many functional roles, including that of scientist, engineer, and manager. As scientist, I have designed and conducted a variety of experiments to evaluate the effects of system limitations on human performance, one of the main areas was that of sensorimotor loops related to eye-hand coordination. As engineer, I developed interfaces and instrumentation to carry out my experiments as well as to support the efforts of the group. An example of this dual function is epitomized by my development of the Virtual Workbench, which was used by myself and other researchers in our group (and one PhD project). Throughout this program I have had a major part in the ongoing interaction with the sponsor (report and proposal writing, presentations, etc.) and also functioned as a manager and mentor to a number of M.Eng. students and UROPs. The VE work branched out to include a number of separate projects that I have been critically involved in (both from performance and management standpoints). Training Spatial Knowledge Acquisition Using Virtual Environments was a program to explore the training effectiveness of various VE representations of complex architectural spaces, with the goal of improving the general ability of subjects to acquire such knowledge. 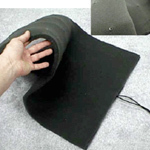 I supervised students in experimental aspects of this work, and with an M.Eng. student developed "room scanner" acquisition hardware and software for managing the texture database. 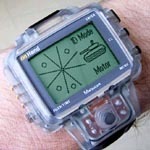 Training for Remote Sensing and Manipulation was a program to develop a VE trainer for underwater remotely-operated vehicles (Imetrix, an ROV manufacturer, was the prime contractor). 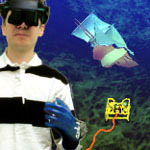 An important aspect of the project was to enhance the operator's ability to work effectively in the three-dimensional world of the ROV, without becoming tangled. My involvement included development of plans for an instrumented tether, a tether awareness trainer, and methods for spatialized audio display of the state of the thrusters. I supervised two M.Eng. theses and a UROP to help carry out this work. Work on the SLS system was supported by DARPA, and is a natural outgrowth of the Sensory Communications Group's ongoing work in hearing and multimicrophone arrays. The long-term goal is to design, build, and evaluate a system that will enable a user to hear sounds of interest in the presence of intense and diverse background masking noise. 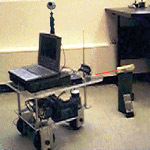 The approach is to use portable or body-worn microphones with the appropriate adaptive signal processing, to place response nulls at jamming locations (and peaks at sound source locations of interest). My involvement started at the initial proposal writing stage, and continued primarily in a hardware engineering capacity. I designed a variety of microphone arrays and user interface devices for the system. I also made field recordings of battlefield sounds at military bases using a laptop pc-based multichannel acquisition system of my own design. The SLS work includes auditory scene processing as a method of automatically choosing the response pattern and for pre-digesting the multiple output channels of data from the array processor. This work is the subject of a further proposal that we have submitted. One ongoing desire in our VE work has been to unobtrusively monitor the physical state of the user, and to reduce the reliance on manual control. 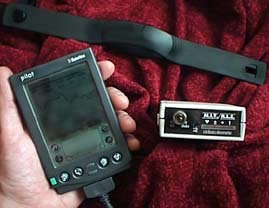 Inputs from physiological monitoring equipment allow for more responsive and adaptive presentation of VE scenarios. Through the years as side projects I have developed various physiological interfaces and have (often as small UROP projects) applied these in interesting ways. This approach was also part of a grant "Realism in VEs" which ran out of funding. Our group has tried to initiate a research program in the use of Virtual Environments for psychological therapy, such as phobia treatment. I developed a stress recording system for use in this work. As a result of meetings with ONR sponsors interested in using VEs for close-quarters battle training, I began development of a distributed haptic interface that used both vibrators as well as direct electrocutaneous stimulation. Some prototypes were built and a proposal for further work was submitted. Since the summer of 2001 I have been pursuing various consulting projects and am developing technology to be used in an unusual web-based teleoperation system. 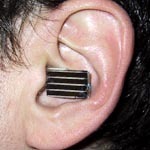 Two projects that are currently taking most of my time are 1. the development of a self-powered sound-isolating earplug to be used in conjunction with an advanced hearing protection system; 2. the development of a miniature head-mounted swept laser display for producing fiduciary indications for use in spatial audio experiments. Through a past advisor at Columbia University I had the opportunity to develop a web-based evaluation and assessment tool that became the core product offering of Children's Progress Inc. Beginning with Dr. Galanter's ideas, discussions, and notes on what the system could be I planned the various components, researched the prospective multimedia and database approaches, hired programmers, artists, and content experts, to create a working "alpha test." Additional investment was raised to continue adding content and maintaining the system, and it is currently being used in test markets in various school districts. The essential idea is that the material is presented in an adaptive manner, in which the child is able to function at his or her own level. Information about the "errors" made as the child interacts with the scenarios is used both to guide subsequent presentations of scenarios as well as to generate narrative reports for teachers and summary reports for principals. In addition to evaluation in areas such as math and verbal arts, the product includes screening tests for various sensory deficiencies as well as tests related to ADD, dislexia, and motor difficulties. I secured a research grant for our lab at MIT/RLE to work on the color vision test which has been presented to positive acclaim at various professional conferences. A few years ago Nat Durlach (senior scientist in my group at RLE) and I spent some time as part of the New England Aquarium Technology Task Force whose task it is to brainstorm novel exhibit approaches for possible inclusion in the new wings of the NEAquarium. A major problem in any exhibit is the question of how to encourage people to "actively observe" the specimens to help them gain some understanding of the behavioral similarities and differences among species. 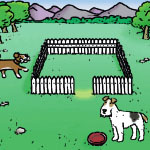 This task is especially difficult with small animals. In one of our proposed solutions, I designed and constructed a teleoperated scale model crab (complete with crab's-eye video), the Robotic Fiddler Crab Project, to help people attend to small salt marsh animals in the context of a large exhibit. 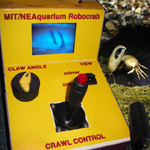 A joystick-controlled prototype was on display in a special children's exhibition at the NEAquarium, and I also kept a colony in our lab space at RLE in which users could operate the crab via web pages and could see the crab's-eye video and other views of the colony via "web cams." Since the robocrab project, some of the equipment has been redeployed in interesting ways including aerial photography and "fish cams." Galanter, E. (PI) & Wiegand, T.E.v. Submitted in response to BAA issued by Under Secretary of Defense for Acquisition, Technology, and Logistics and Combating Terrorism Technology Support Office Technical Support Working Group. Submitted in response to National Eye Institute Small Grants for Pilot Research (R03) solicitation. MIT / Research Laboratory of Electronics. Colburn, Darrell, Desloge, Durlach (PI), Greenberg, Oxenham, Shinn-Cunningham, Wiegand, Zurek, & Zweig. Submitted to National Science Foundation CCR-ITR Medium (Group) Grants. Wiegand, T.E.v. (co-PI) & Srinivasan, M. (co-PI). Submitted to the Office of Naval Research, Capable Manpower FNC. A Tracing Pen for Blind and Visually Impaired Persons. Berkovitz, R. (PI) & Wiegand, T.E.v. Submitted to the National Science Foundation, Small Business Innovation Research Program Office. Post Doc, Elec. Eng. / Expt. Psych.